We are a family practicing the grace and wisdom of Jesus Christ. We joyfully minister to the spiritual, emotional and physical needs of life-seeking people. We celebrate the rich diversity of our members, and we gladly invite others to join us in service to Christ. "Sunday morning worship is a traditional service with a twist of the unexpected." Thanks for visiting the West Main website. On this site you will find pertinent information about our church; from news to sermons, directions to pictures. 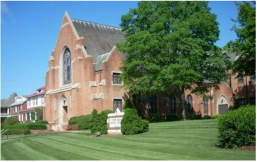 If you are looking for a church home in Danville, we hope you will visit us. We are a vital congregation of about 525 people located in the Old West End District. West Main is unique. Sunday morning worship is a traditional service with a twist of the unexpected. The Wednesday night meal at the Emmaus Cafe is Bible study in blue jeans. During the week...well, expect anything, from a huge Halloween celebration for the community to a Vacation Bible School block party and some of the best missional opportunities around. West Main is a church centered upon the person of Jesus Christ. Jesus is not only our savior, he is our teacher, and his life and spirit guide us in everything we do and decide. We gather with the express purpose to “see Him more clearly, love Him more dearly, follow Him more nearly, day by day." West Main is not beholden to any denominational affiliation, though we extend our mission through Virginia Baptists, the Cooperative Baptist Fellowship and about 25 other mission groups.